The Hub is excited to offer a unique shopping experience! 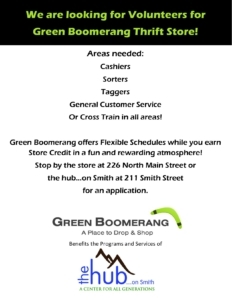 You will find amazing deals at Green Boomerang thrift store and support the programs and services at The Hub! 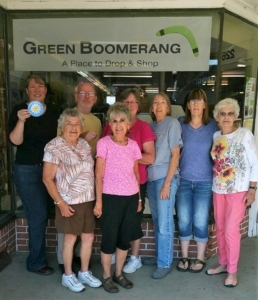 Green Boomerang is located in the heart of downtown Sheridan at 226 N Main St.
By shopping with us at Green Boomerang, you are joining us in our mission to celebrate, embrace, and serve older adults for the betterment of our community! For the safety of our volunteers and customers, please view our donation guidelines. Find Green Boomerang on Facebook to keep up to date on the latest happenings! For a map of all of Sheridan’s thrift store click here. 211 Smith Street in Sheridan.